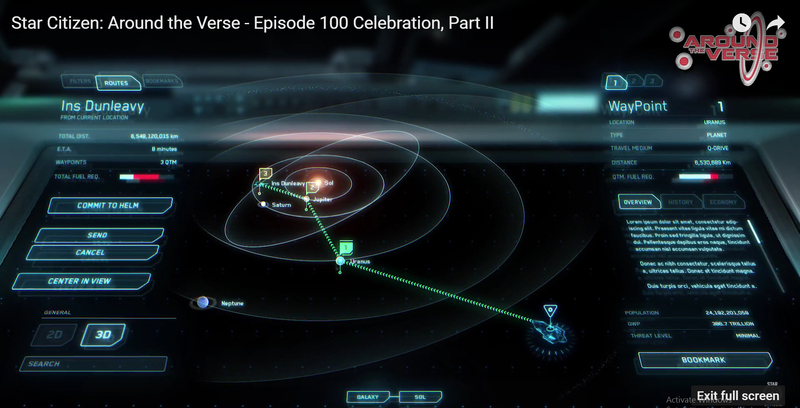 On ATV Episode 100th Celebration Part 2, we saw concept work for an in-game version of the ARK Starmap. The ARK Starmap is the physical representation of the known Star Citizen universe we’ll be inhabiting. Based on the $6 million USD funding goal, the game is expected to release 100 star systems. You can check out that bit of ATV here and see some of the amazing concepts for yourself. Having readily accessible information about a star system’s composition, government alignment, jump points and current population, economy and danger conditions, will be vital for all players. This data feeds into your efficient completion of missions and developing successful player career. It’s encouraging to see that the in-game map won’t be an afterthought. Cloud Imperium Games can’t create a map for every variant and flavor the playerbase might want. There are too many variables and subjective preferences. Furthermore, no matter how useful they make the in-game map, in certain scenarios, a low budget bird’s eye view of the same data is more effective. For example, if you’re trying to decide which of your ships to use for the shortest route from Sol to Goss, while making opportunistic cargo hauling stops, using the ARK Starmap to plan your route isn’t very effective. In this case, it’s faster to have a single view of all star systems, versus flipping through multiple screens of data. At a minimum, you want to see ALL jump point options, ship size restrictions and information on the local economy and/or population. 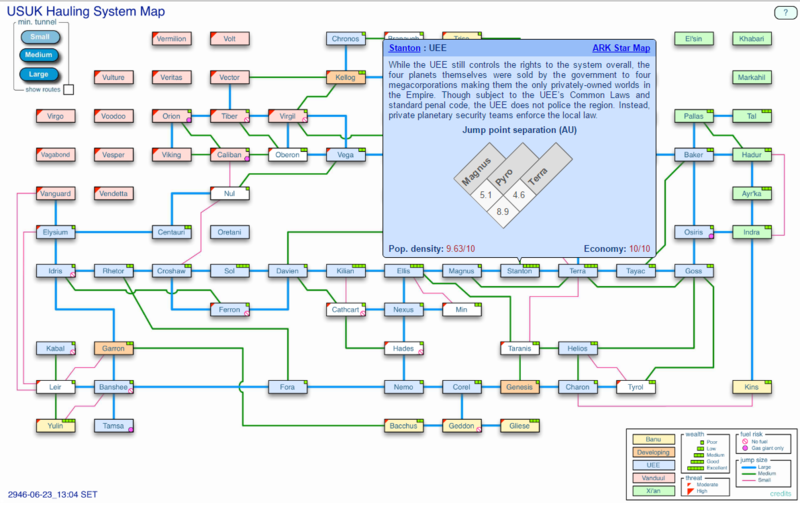 Guess what, there’s a map just like that already, created by a player organization. Players have been creating custom maps using ARK Starmap data since it was deployed. Putting their personal aesthetic and needs’ bias into the design, they can customize a map to meet very specific objectives. In addition to my own Starmap Matrix, here are a few favorites. New to the club, is the USUK Hauling System Map. This fits my example of seeing all systems and jump points, along with population, economy and danger stats. The map is interactive. Clicking on a system displays a description and jump point distances. A very handy tool for planning cargo runs. 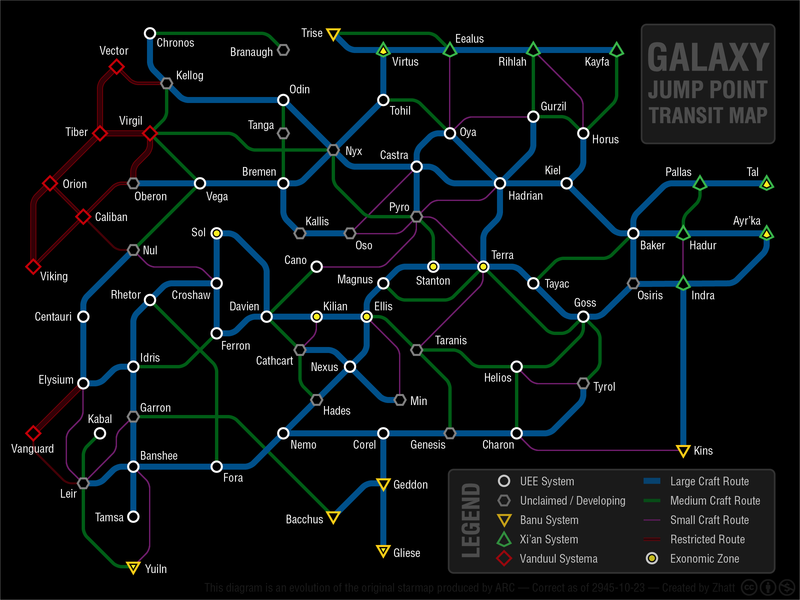 Not everyone is, but I’m a huge fan the Galactic Transit Map by Selbie Le-Grille. This map uses a circle and spokes methodology for visualizing networked data relationships. Selbie decided to use Sol and Terra as the central points in his design. He won MVP for this contribution. 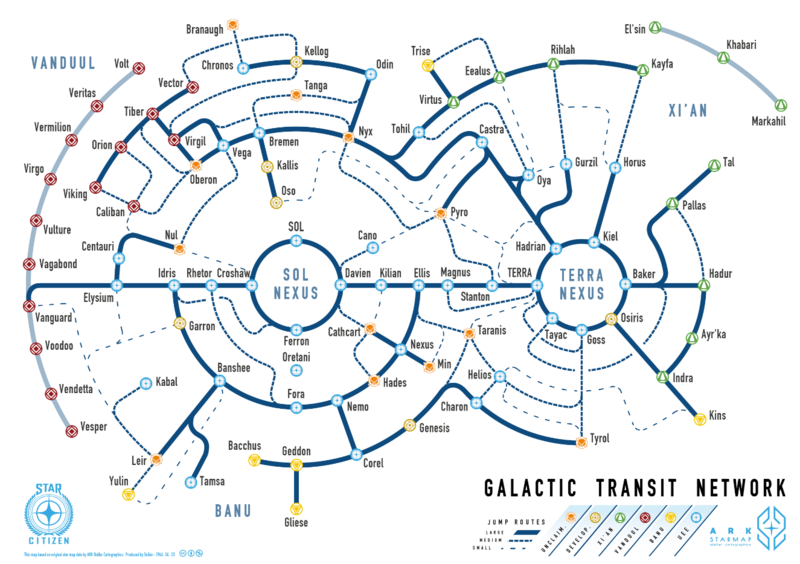 And for a simplistic approach that does what it claims, we have the Galaxy Tube Map. No frills. No muss. It’s an easy to use map of all systems with their jump points – the perfect one-page reference. To see more player created maps, here’s a link to a thread on the Star Citizen subreddit community. We’re trying to keep a running list of all player made maps. It’s definitely worth bookmarking. If you’re like me, a HOTAS user, I simply don’t have enough buttons on my device to support even the minimum set of commands I want at the ready. My current setup also doesn’t support having the keyboard within a reach that’s effective to be used during combat. So I was elated to come across the idea of using a program to carry out a few basic commands. This article will help you differentiate between VoiceAttack, Profiles and Voice Packs, and where to find additional information if interested. As an ability, voice attack is a method of using your voice to initiate keystrokes. The name is a bit of a misnomer. The capabilities are not tied to attacking / damage. It’s any set of keystrokes. You can launch a game. Establish your starting setup in an application. I use it to start and stop Fraps recordings so I can stay in the thick of combat and capture video using my voice. VoiceAttack (VA) the program, is a popular software application used to execute by voice, commands that would normally be a series of keystrokes and/or mouse interactions. Therefore, if you’re interested in playing around with using voice initiated commands, your first step is to acquire the software. You can purchase VA from here. The object that VA uses to know what to DO when you SAY certain words or phrases is a Profile. The Profile is a separate file with a .VAP extension. The profile itself contains a series of commands you want executed, mapped to what you’ll say, when you want those commands to be carried out. Oftentimes, people want the successful execution of command followed to be up by an auditory confirmation. This is achieved by using your computer’s operating system to turn text into speech. This allows your PC to say, “Done.” when a task is completed. Using the Text-to-Speech engine is achieved by using the Say command in a profile, followed by the word or phrase to be spoken. Your operating system’s Text-to-Speech engine interprets the text into an auditory response using its default voice. If you don’t like your computer’s default voice, you can purchase additional ones from companies such as Ivona. However, auditory responses are not required for a Profile to work. And you shouldn’t invest in one until you’ve determined you like using voice attack commands in the first place. Simply having a profile of commands that match the keybinds in the target game, is all you need, after installing voice attack software. You can download Profiles for free! There are members of the community who have shared their profiles. Of course, mileage will vary on how well they work or suit your tastes. Search the official RSI Forums, Star Citizen section on Reddit and the internet in general. A Voice Pack is a Profile that enhances the execution of commands by adding a significant amount of voice over / audio work. This is often done using professional voice actors or celebrities and may include additional narration that is not directly tied to executing commands, such as role-play conversations. HCS offers multiple Voice Packs for Star Citizen, as well as other games. Many players enjoy having this more elaborate version of a Profile. It’s fun and can be more immersive. However, it’s not a required component. You don’t have to own or purchase a Voice Pack in order to use voice attack commands. To be perfectly honest, Star Citizen has more keyboard commands and uses modifier keys more than any other game I’ve played. I can barely fly in Star Citizen without using VoiceAttack. My HOTAS doesn’t have nearly enough buttons to accommodate the bare minimum of what’s needed. Trying to reach over to a keyboard in the middle of combat isn’t something I want to juggle. Therefore, it’s essential for me to keep my profile updated with changes CIG makes to control schemes, as they’ve done in patch 2.4. This type of large scale change is another reason why I’ve opted for a small profile during alpha. The steps for creating and/or editing a Profile is very straight forward. You must have Voice Attack and you must know your current keybind settings in the game, in order to tie them to a voice command. With those two in hand, you can create a basic profile from scratch or edit one you download for free or may have purchased. I wrote an article last year detailing the steps and they haven’t changed since that time. I hope this helps clarify voice attack as an ability vs. VoiceAttack the software vs. Voice Packs. I use VA religiously and own a Voice Pack from HCS. During the SC Alpha however, I’m sticking to a small one I created myself that’s easy to manage and only contains the dozen or so commands I can’t live without during combat. https://redacted.tv/wp-content/uploads/2016/06/Voice-Attack.jpg 215 460 Alysianah /wp-content/uploads/2018/01/LOGO-340x156-300x138.png Alysianah2016-06-16 01:54:252017-12-14 17:30:46WHAT'S ALL THIS VOICE ATTACK STUFF? Today we are taking a look at a couple of cool things made by the Community for looking at ship sizes and their scales. This contains top down pictures of all the Star Citizen ships we have the specs of & their sizes. All the ships are sorted into their manufacturers & it even shows the footprints of the Caterpillar and Banu MM at the moment. It’s regularly updated with the latest ships and is a forum post that you should bookmark. Great work by sebman there the Original Poster. It’s built in the Unity Engine and takes the ships from the Star Citizen Holoviewer and allows them to be viewed in the Whiteboxed glory. Now obviously these assets are simple versions of what we will get in game, the idea here is to get a feel for the scale of the ships and a basic look at the ship. It is even Oculus Compatible, tho I have tried that myself with this, it works fine without VR too. I am not sure how often it gets updated, but I hope one day we can see all the ships here.